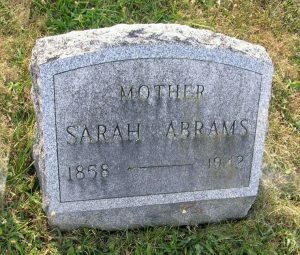 Abrams— Died at the home of her daughter, Mrs. Leah Waldhorn, 303 Oneida street, Aug. l8th, Mrs. Sarah Abrams, aged 77 years. She is survived by two daughters, Mrs. Waldhorn, and Mrs. Sol Friedman of Chicago; two sons, Max Abrams, Brooklyn, and Irving S. Abrams, Chicago; ten grandchildren and six great-grandchildren. Funeral services were held in Syracuse Wednesday, Cantor Samuel Arluck officiating; interment in Adath Yeshurun cemetery. A native of Germany, she had resided in Rochester and Syracuse before coming here to live with her daughter three years ago.